A perfect gift for Mom, girlfriend, or teenagers, create your custom toiletry bags, adorned with your favorite photos. Create one as a perfect travel toiletry bag gift for Mom, sister or girlfriend who travels. Create a customized toiletry bag designed by you. Make your own monogrammed toiletry bags with a design or photos. We make these bags for women, ladies, moms, wives, daughters and grandmothers. These bags are customized to suit the recipient, owner, or buyer. Our toiletry bags make great travel wash bags, especially for those busy people on the move. They are personalized so your travel toiletry bag will always be a constant reminder to the carrier of their friends or family while traveling. Size 9.5" x 6.5" x 4"
What Will My Personalized Toiletry Bag For Women Actually Look Like? This ladies toiletry bag personalized with your own pictures makes such a special gift for any woman in your life. The trim color choices are ivory beige, pale blue, soft pink or black, so you can customize it based on their favorite color or general fashion style. Printed on the front as standard, or also on the reverse at an added cost, your personalized photo wash bag is truly unique. The satin blend we use captures the fine details of your photo and prints to an HD quality. The slight sheen reflects the light subtly, giving your bespoke wash bag an elegant appearance. The metal heart pendant on the zipper not only looks good, but it’s so much sturdier than an ordinary plastic zipper that sometimes gets stuck or snaps off entirely. Who will appreciate a personalized wash bag? We don’t know about you, but we think toiletries are also a girl’s best friend, so treat your daughter, mum or best friend to a bespoke women’s wash bag that’s truly personal to them. Ladies toiletries are a necessity, but that doesn’t have to mean they should be unoriginal and basic. Personalized wash bags are also great for children to take on school trips away, and when personalized with their photo and name there’ll be no excuse for a case of mistaken toothbrush identity! Like many of our products, the personalized toiletry bag comes with a quantity discount, so buy more than one today and save money. Your personalized wash bags are all handmade to order by our textile professionals, who hand-cut and sew each toiletry bag to an exceptionally high standard. Your photos or design are printed onto the satin fabric using our specialist process to make sure the ink and colors remain vivid, giving your photo wash bag a longer life. Care: Surface wipe with mild soapy damp cloth. No abrasion – materials will remain smooth. Your personalized women’s wash bag is landscape, so choose photos that are similar to this frame to get the best print quality possible. As standard, the front will feature your photos or design, but for a truly original custom made wash bag, have the same or different photo printed onto the back. Sometimes, choosing just one photo can be hard! For a sentimental present, have your wash bag personalized with a cherished family photo that’s guaranteed to bring a smile to your recipient’s face. But for a quirky wash bag with a difference, creative designs, graphics and cool text inspired by designer bags really make an impact. 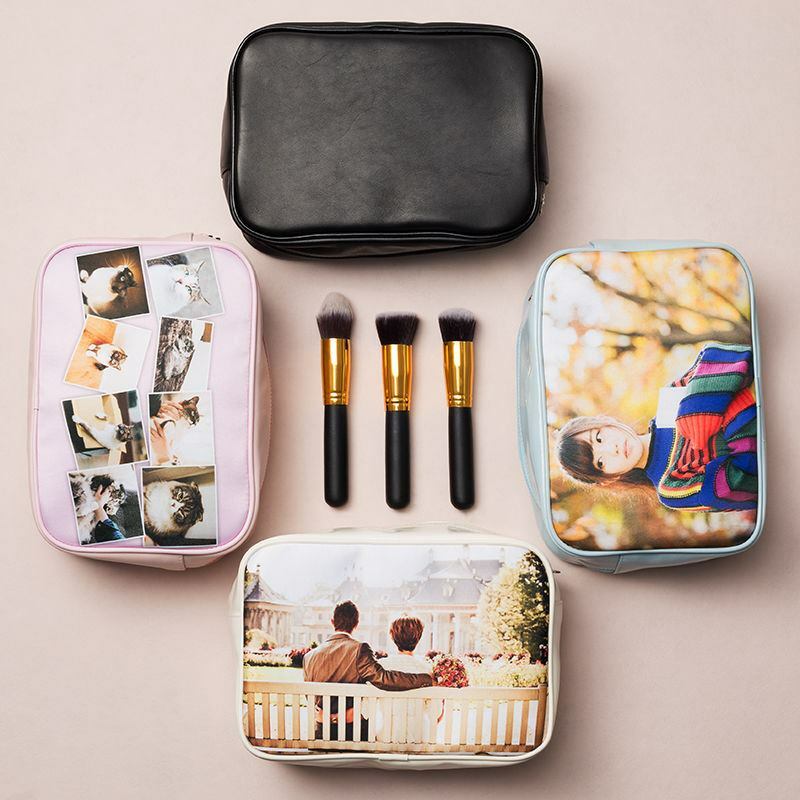 Customizing the photo wash bag with a colorful collage is a popular design and a great way to show someone you care, so why not dig out some golden oldies and have a trip down memory lane. Handmade to order from canvas or real leather. Print the front and back with your favorite pictures.